The Outsiders are your Fantasy Highway League Champions! This entry was posted in Uncategorized by Peter Whittenberger. Bookmark the permalink. check that spoon again – it is you who will feast on the sorrow of epic faiure. Rusty meow meow forever! So do I, the Rusty Meow Meows are going DOWN in week 2!!! You know who I feel sorry for? Dancing Queen – for real; the Rusty Meow Meows will tear . . . Dancing Queen . . . DOWN. Green cars? What is this 1973? I don’t think so – white cars are the future, and white cars will rule this week’s matchups. Your name says it all, The RUSTY meow meows, that’s all I got, you’re going down!!!!!!!!!!!!!! Go GREEN CARS RULE!!!!!!!!!!!!!!! So week 2 of the Fantasy Highway League has come and gone with the competition really heating up. 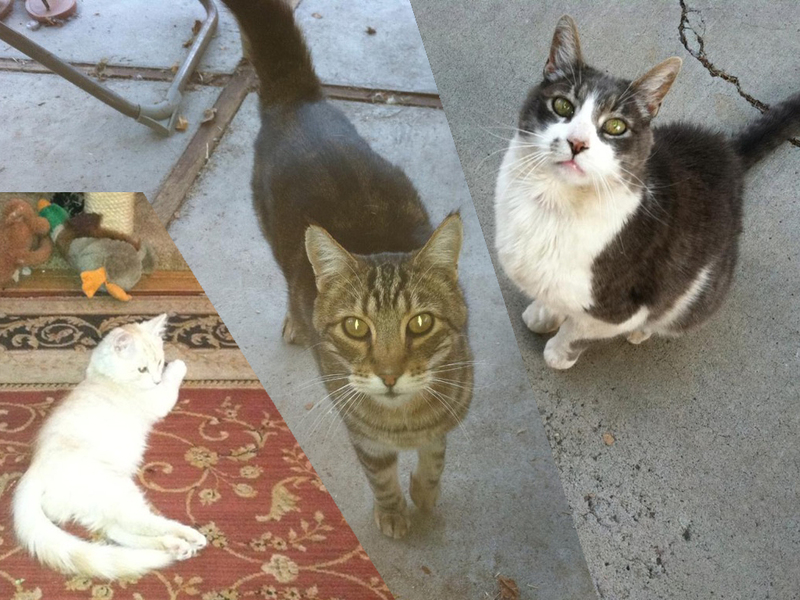 The Rusty Meow Meows, representing white cars, have taken the lead. A lot of white vans cruising around today (good for the Rusty Meow Meows; concerning for the residents of Northern California). The Noir Four recorded her first win over Blackstreet and Dancing Queen is still bringing up the rear, but just relax because its only week 2! All right car counting fans, its your favorite time of the week! It was another barn burner in the Fantasy Highway League. We had our clash of undefeated titans and after “Spelling Gate”, the contest between these two rivals did not disappoint! Car after car came down the highway and the Outsiders handed the Rusty Meow Meows their first defeat of the season. The 9 Year Plan dominated the still winless Blackstreet while the Noir Four barely escaped a surprise upset at the hands of Dancing Queen, the Indianapolis Colts of the Fantasy Highway League. With the season more than halfway over next week’s battle between Dancing Queen and Blackstreet will be a battle to get out of the basement. Good luck and we’ll see you again in a week! Its week four of the Fantasy Highway League and what a week it was. It seems the Outsiders have all but wrapped up first place in the competition, easily destroying the Noir Four. The Nine Year Plan has taken over second place, sneaking a win over the Rusty Meow Meows in an upset. The biggest news of the day, however, is Blackstreet finally recorded her first win. In what some car counting fansites have dubbed “The Toilet Bowl”, Blackstreet destroyed the woeful Dancing Queen. Sweet hell does America hate green cars, but don’t fret Queen fans, miracles could still happen. Stay tuned for the epic conclusion of this incredible competition next week. 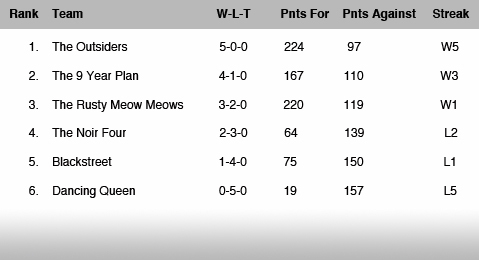 The Outsiders have taken the Fantasy Highway League Championship! With an impressive undefeated record, the Outsiders dominated the competition. Starting from humble beginnings, the silver car representative persevered and overcame all obstacles. All the other colors of the automobile rainbow pale in comparison to the glow of the Outsiders. Congratulations!! !